Down 8 percent from their 2007 peak, financial stocks are the only major group in the S&P 500 Index that has yet to fully recover from the bear market. (Bloomberg) --Time may heal all wounds. But the decade since the collapse of Lehman Brothers Holdings Inc. hasn’t been long enough to restore investors’ faith in banks. While this week marks the 10-year anniversary of the Lehman bankruptcy, an event seen widely as a catalyst for the global financial crisis, data on stock prices and fund positioning suggests the aversion to the banking industry hasn’t gone away. 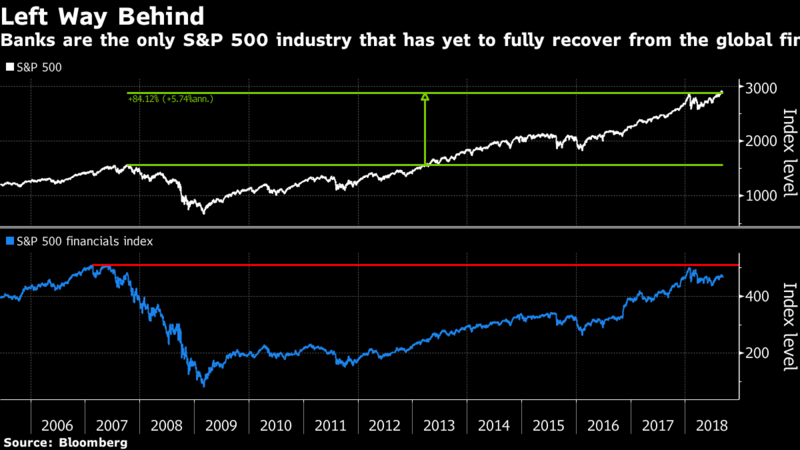 Down 8 percent from their 2007 peak, financial stocks are the only major group in the S&P 500 Index that has yet to fully recover from the bear market. Money managers are shunning the industry. Banks were the most-avoided industry among hedge funds at the end of June, while mutual funds cut their holdings to a five-year low, data compiled by Goldman Sachs showed. Banks have seen their importance waning in the market as the S&P 500 rallied on to trade 80 percent above its 2007 peak. Once the biggest industry making up more than one-fifth of the market, financials have now fallen way behind technology. The carve-out of real estate in 2016 certainly hurt, but that only explained a fraction of the current 12 percentage-point gap to tech. Blame the underwhelming performance on regulations and the weakest economic recovery from a recession since World War II. While the requirements on shedding risky businesses and holding more liquid assets have made lenders better equipped to withstand financial shocks, profits suffered. Meanwhile, loan growth has stayed muted and interest rates stuck near record lows, giving bears reason to shy away. At the start of the third quarter, hedge funds tracked by Goldman Sachs had 10 percent of their assets in financial stocks, 4.5 percentage points below the group’s representation in a benchmark. After favoring banks in 2017 in a clash with hedge funds, managers of mutual funds are now joining the fray to dump them. Relative to the market, the industry’s average weighting in portfolios dropped by 1.1 percentage points over the second quarter, the biggest decline among 11 sectors. The skepticism is at odds with the industry’s improving fundamentals, according to to Mike Mayo, a banking analyst at Wells Fargo. The past 10 years has marked a U-turn for banks in everything from capital and cost control to aligning executive compensation with shareholder returns. The end result: the lowest earnings volatility in a generation, he said. Thanks to tax cuts, banks and insurers are forecast to boost profits by 26 percent this year, roughly in line with the S&P 500. Yet measured by revenue, its 4.8 percent expected growth trails all other industries but utilities and consumer staples, analyst estimates compiled by Bloomberg show. Trading at 16 times profits and 1.6 times book value, financials are ranked at the bottom of the pack in the S&P 500. But at a time when growth is all the rage, being cheap is not good enough.